Steve Trevor and Wonder Woman in the heat of battle! Action-packed statue presents Chris Pine and Gal Gadot. Designs taken from the 2017 Wonder Woman movie. From artist James Marsano, the limited edition piece stands 12-inches tall! 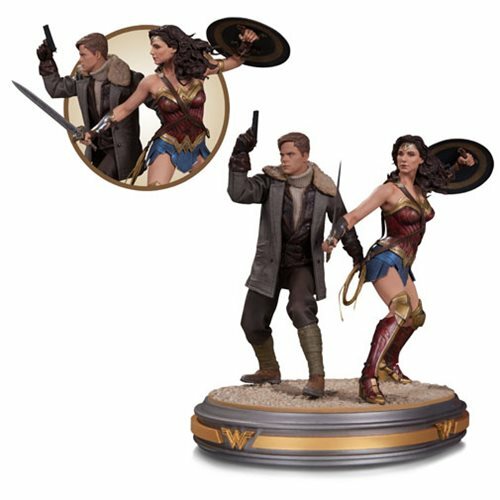 With designs taken from the action-packed film Wonder Woman, this stunning statue features Steve Trevor and Wonder Woman in the heat of battle. Talented artist James Marsano wonderfully captures the intense scene of war featuring Chris Pine as Steve Trevor and Gal Gadot as Wonder Woman. Armed with her shield and sword, the Amazonian Princess braces herself for the next attack while Steve stands ready by her side. This excellent Wonder Woman and Steve Trevor Movie Statue comes ready for display with a beautifully designed base themed with her iconic logo. Made from cold-cast porcelain and hand painted, the statue measures about 12-inches tall. It's a limited edition of 5,000 pieces. Ages 14 and up.